It hit me while on the plane back to Charleston last week. I was fidgetting with excitement at the thought of seeing B. again soon. I did have a blast in L.A and Seattle but it would have been nice to share that with him. All the moments. On the moment. I just couldn't wait to get home and tell him all about the week. I still need to sift through my hundreds of pictures and thoughts. The people I met, the friends I saw again. The exchange of information. Being part of a community. All these things are always better shared. He laughed with me and listen to my stories. Dozens of names he had never heard before. Patiently. He asked questions and encouraged me. And so, while sitting on the plane, about ready to take off, it hit me: Saint Patrick's Day was just around the corner. This household is half Irish after all. I had to do something to mark the occasion. Knowing us we will be debating the virtues of historical markers versus those of green foods, green shirts and green beer. Still, he never fails to help me keep up with my roots so I wanted to do the same for his. Minus the green. Plus whiskey instead. Green is far from being my favorite color to start with and I also did not feel like messing with green coloring. There was plenty of that during the Seattle workshops, well done and beautifully mastered. I was worried of ending up with Shrek green instead of Irish green. (I did before, hence the reference). I like to have an easy dessert ready to be served for the first meal after my parents get in town. Tonight it's quiche and salad and these Chocolate Whiskey Pots de Creme served with some plain almond macarons to use up the egg whites left from the custard recipe. It's pretty sums up perfected comfort this time of year when the days still have this distinct nip in air. A foot in between two seasons. As soon as I am done squeezing my mom silly, get done with work this week and go through my thoughts, I'll post more about the workshops but you can start by reading Rachael's recap of L.A here. Place 6 to 8 ramekins into a roasting pan and set aside. Preheat oven to 350F and position a rack in the center. In a large bowl, whisk the egg yolks with the honey for 2-3 minutes. In the meantime, bring the milk and cream to a simmer in a large saucepan set over medium high heat. Remove from the heat and add the chocolate to the mixture. Slowly whisk until the chocolate is completely melted. (return over low heat if it needs a bit more heat to dissolve). 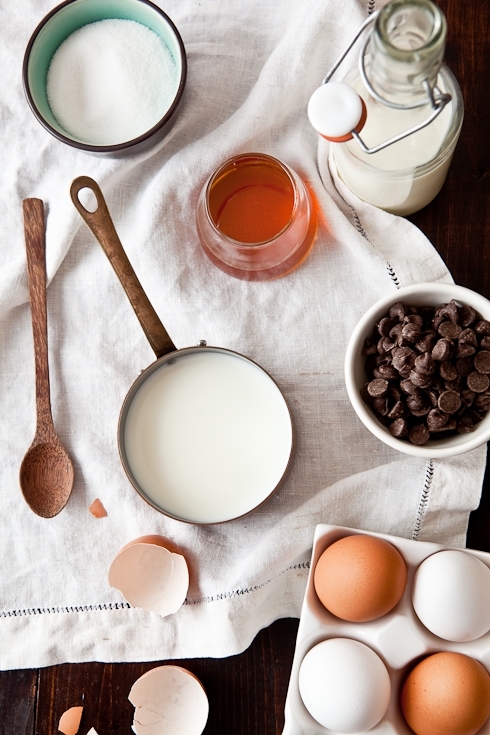 Slowly pour the chocolate mixture over the egg yolks and honey, whisking constantly until both mixtures come together. Add the whiskey and stir briefly. Divide the chocolate batter evenly among the ramekins. Pour hot water into the roasting pan so that it reaches halfway up the sides of the dishes. Bake for 30 to 40 minutes or until the cream appears just set. Remove from the heat and let cool to room temperature. Refrigerate at least 2 hours before eating. Prechauffer le four a 180F et mettre une plaque au milieu. Dans un grand bol, battre les jaunes d'oeufs et le miel pendant 2-3 minutes. Dans une casserole, faire chauffer le lait et creme jusqu'a ebullition. Retirer du feu et ajouter le chocolat et remuer jusqu'a ce que le chocolat soit fondu. Verser l'appareil sur les jaunes d'oeufs. Ajouter le whisky et melanger. Verser l'appareil dans 6 a 8 ramequins et les mettre dans une plat profond allant au four. Verser de l'eau chaude jusqu'a a la moitie de la hauteur des ramequins. Faire cuire 30 a 40 minutes. Ooooh - this sounds like my kind of St. Patrick's Day for sure! Yum! What if I can't have whiskey? What substitute would you suggest? Nida: Hi, you can use any other alcohol of your choice or if that is the problem, leave it out completely and add 2 teaspoons of vanilla extract if you wish. yum!!! I love chocolate and whiskey together. I make whisky brownies that everyone loves. The combo can't be beat! Whiskey is ALWAYS a good idea, and these look fantastic. I'm glad you get to spend some good time with your mother. 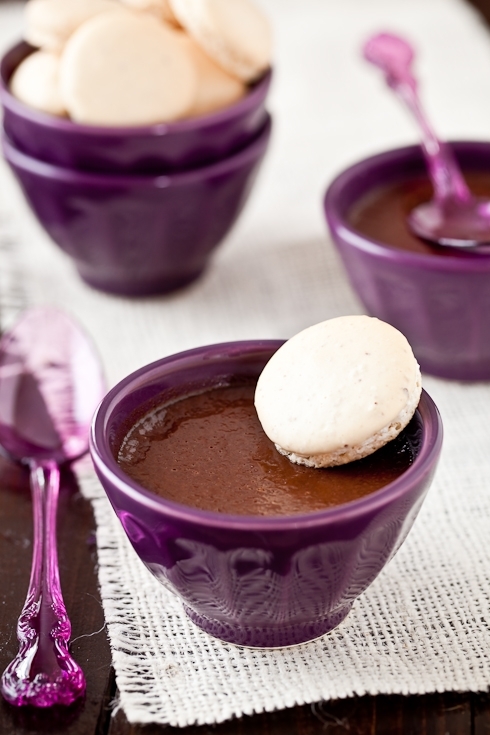 Pots de creme is one of my FAVORITE desserts--total indulgent comfort food! I love the sound of these, and love how you did something St. Patty's day sans green. :) If you come back to L.A., how about we make a trade? I'll make you a Japanese meal, and you make pots de creme. Deal? And make sure you bring B.
Purple is gorgeous colours and goes so well with your macarons and pots de creme! I'm craving some chocolate after reading this. Can't wait to read more about your workshop. Yum! You and B are so cute...I can just see you guys, with Bailey and Tippy close at bay. I am so happy you're able to spend time with your mom...and wish I would wave a magic wand! This looks super yummy! I love those purple bowls and spoon. Pots de creme is very comforting, and this looks like an excellent recipe to celebrate St. Patrick's Day. maybe I'm outof the loop but where do you find such purple spoons? swooon. also the dessert sounds divine...too bad all I have is irish cream! A big hug for your mom, Helen! All the best wishes to her and your family. And I love your pots de creme! I love this approach to St Patrick's Day! A gentle nod goes a lot farther than all that exhausting, phony paddywhackery! I really want to make this, because they look so scrumptious, and I have a question too. I have exactly the same bowl as yours here (different color), can I bake using this bowls? Thank you. Oh. My. Whiskey and chocolate, what could be better? And Irish blessings to you, your mom and B. Your beautiful post and pictures caught my eye, as always. I then clicked to see what "problems" your mom was experiencing. My husband has had 2 bouts of colon cancer and is still waiting to hear about something that showed up several months ago. I completely understand your anxiety and desire to be with your mom (and give big hugs!). I spend every day with my hubby, cook and write my blog. Life is precious, so enjoy your mom and that fabulous dessert! Elra: I am not sure I completely understand your question: I did bake mine in the little bowls. Shannon: I found these at a shop in L.A (can't remember the name now). Thank you so much for this recipe. My husband and I had this around a year ago at a restaurant and ever since he brings it up now and again with this glazed look in his eyes! So now I can make this for him - he'll be thrilled! safe to say i will adore these. i love any type of pot de creme, and favorite chocolate cake is whiskey-laced. looks wonderful! Oh my! These sound delicious. Isn't wonderful to bake with mom and please the husband at the same time. I must give these a try. whiskey? mmm! this is genius. and topped with the pretty macaron shell, perfect! Doesn't this sound like just the thing for St. Pat's day? I love the purple bowls. We're both Irish, and we get a little tired of the green as well. But never, never tired of Ireland! Thanks for this recipe and the gorgeous photos. Hope you have a good time with your parents! Specially with your mom. I hope she's getting better. Looks irrestible! Must try this. Beautiful photography. Thanks for sharing. Ooh wow these are brilliant! Like a sweet and chocolatey loving embrace indeed!! Tell your Mum to keep on battling!! Che delizia...le tue foto poi sono dei capolavori, complimenti! yeah yeah whiskey that's nice; what did you think of seattle? tired of making macarons? hehe. not that i could have come (i'm cheep and poor) but i would have stood outside the window with a sign acting like you're Meredith and Matt. But alas, Seattle not for a few years. Mallory Elise: there is powdered white food coloring (check on sugarcraft.com) but you can just bake them at low heat and take them out right when they are about to get some color, let the oven cool off and stick them back in there to dry when the bulk of the heat is gone. Now THIS is the way to celebrate St. Patrick's Day! I'll take whiskey-spiked desserts over green food coloring any day. You and your mum are in my thoughts. 1st: your photos are more and more gorgeous, the styling and the choice of colours are always perfect. I once tried a whiskey & chocolate cake and I liked the combination very much so I'm guessing your pots de crème would be perfect for me! Oh I just love this! I've never made macarons before and this seems like a good time to try them. But I don't see a recipe for your plain almond ones. I know this is a very basic question, but can you point me in the right direction for this recipe? Thank you so much for sharing! Your photography is just stunning and I am so excited to try your recipes! Wendy: check on the sidebar under "Macaron Tutorial". The recipe is in the pdf document. I LOVE the purple. Such a great color for photos! And seriously - can I come see you and get a macaron lesson?! Who couldn't love coming to visit when there is chocolate waiting? Sounds like my kind of dessert. And those bowls are the most amazing shade of purple! Where in the world did you find them? Made these last night with a good Rye Whiskey (we only had cheap irish whiskey)- they were so tasty! The whiskey and chocolate were perfectly balanced. Thanks so much for the recipe! Sending my best to you, your mom, and family! Hugs!! We had these for our St. Pat's dinner and they were delicious! Thanks for the new recipe. It's nice to have a great chocolate alternative to our panna cotta standby. Beautiful setup - everything looks delicious! I really love the purple bowls and spoons. Where did you get them? Sunshine: my mom gave them to me - I have seen similar ones at Anthropologie. I think they are from the same manufacturer in Portugal. Angelyn: read above. I got the spoons while in L.A a couple of weeks ago but I can't remember the name of the place. It was a combo French bistro/store. Really great stuff in there. Sandra: thank you sweetie! I know you are busy too. Warm thoughts kindly accepted. Chocolate whiskey pots de creme? Yes please! These look delicious and now I want to make them. Je vais le traduire en français..en tous cas, cela à l'air très bon déjà comme ça en photos...Bon week-end ! Wow I seriously "heart" those purple bowls! Wherever you go it's great to come home! Anything with chocolate and whiskey has to be good! Yum! What a genius idea. oh, I`ll do this, cause I love pots de creme in variety ways! 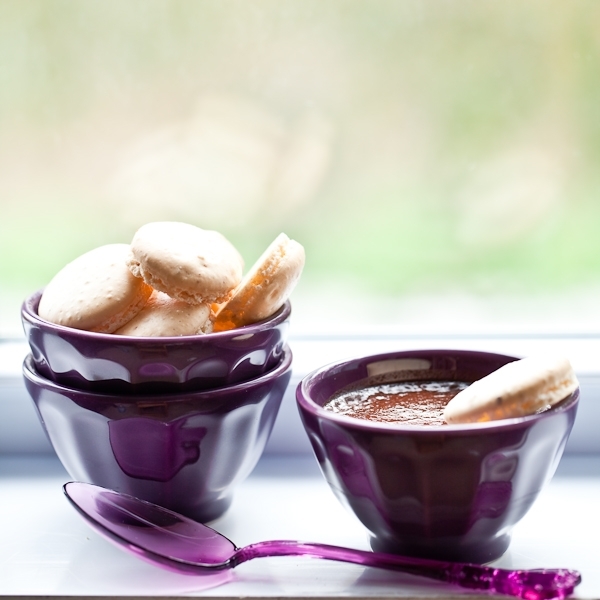 Oh Helene, how funny, we did indeed have pots de créme on the brain :) Yours are simply stunning and I just love your purple bowls, such a great alternative to white ramekins! Ah well, Miss Tartelette... I shouldn't blame you. I am weak. Your heavenly delicacies I must try! My first endeavor will be plundering your archives for a recipe of my favourite tart, lip-smacking lemon!! I hope this finds you & your mother well. And by the way, as a photographer I think your images are wonderful. It's obvious you take care to choose the right props, and composition which do your edible art much justice. I have made these delicious pots de crème for my boyfriend's birthday last Friday. They were absolutely delicious! I am lactose intolerant so I used soy cream and lactose-free milk and the recipe turned out great. I used a wonderful 18-year-old Macallan from our collection we brought back from Scotland, put 3 tablespoons in, the flavor was subtle but there. Couldn't have been better! where is the love for your vegan readers? hopefully we will see some recipes that we can all enjoy. Binyamina: I fear that you will have to pick which recipe looks good to you and convert it to be vegan. This site is a reflection of who I am as a person and that reflects what I do on a daily basis which is far removed from veganism. There are many ways to adapt my recipes to suit ones choices and preferences (substitute dairy for dairy free, milk chocolate for dark, etc...) and there are entire sites devoted to the content that you are seeking which makes this blogging world that much more interesting to me. I do not pretend nor wish to appeal to all cooking, cuisine, lifestyle as this is not and never pretended to be the direction of this site. I do read and appreciate all comments but I believe that there are bloggers far better suited to answer such specific and targeted audiences. I hope you will find much to enjoy in the stories and pictures presented here and hope that you will feel confident to try to adapt them to suit your needs and preferences. je découvre tout juste ce blog ... Et je crois que, bien qu'il soit lundi, 5h58 du matin, c'est LA découverte de la semaine ! Enregistré sur google reader après avoir exhumé les articles ! Do you think adding cinnamon to this would be good? The recipe sounds like it could be a tasty addition to it. especially if you ae using the vanilla in place of the whiskey. Has anyone tried it? My son's birthday is St. Patrick's Day. When he was small I use to tell that all the parades on TV were for him celebrating his birthday. Finally he realized what it was, St. Patrick's Day. He is now 40 soon to be 41, So this a must for his birthday! !